On my travels through Asia I often had BBC World as my only English speaking companion to keep in touch with what’s happening around me. August this year marks the 60th anniversary of India and Pakistan becoming independent countries and laying down British rule. To honor that, BBC is running a very interesting series of reports on modern India and Pakistan, often filmed through the eyes of returning expats who come to see how their home country has developed. Particularly interesting was a report by a Pakistani actor sporting the broadest of Scottish accents, Glaswegian no less, on the entertainment industry in modern Pakistan. He openly admitted that he had come to reconfirm his preconceived notions that he was far too modern for his brethren back home only to find himself being told that it is him who has antiquated views on his country. It’s hard to summarize all the reports in brief but between what I saw on these reports and what I observed myself on my travels it seems that we in the West have a very distorted view of how the rest of the world develops. And I think it is this distorted view that makes us miss the beauty and richness of many places outside of the realm of what’s familiar to us. Sure, places like Pakistan and India and certainly China still face their challenges and enormous inequality. But they’ve come a whole lot further than many of us care to acknowledge and if we don’t pay attention, they may eventually pass us by before we know what hit us. Keep your eyes open. It’s a big world out there. Eh, where’s the moon gone? Today, Aug 28 Sydney was graced with the spectacular view of a complete lunar eclipse. Only yesterday Mars was as close as it will ever be in the next thousand years or so. So, quite an auspicious time for star gazers these days. Just as I got off the boat from the whale watching tour one of the boat crew told me about the eclipse. Ever fascinated by all things space, I wandered along the harbor over to where the opera house lay, as I remembered having a great view on the moon from there in days prior. As I came up towards the opera house, I saw a group of people heading some place rather determinedly. I tagged along, thinking that these locals probably knew of a great spot to see the eclipse. After all, we were only minutes away from its start. And a great place they did know. We ended up walking up to a boat waiting at the mole to take on passengers. Apparently, this was a privately chartered boat that someone had organized for himself and his friends to get away from the light of the city to get a better view. I asked the organizer whether I could follow on board, and he agreed to have me join. So, I got a second boat ride that day, this time hunting the moon instead of whales. My photos obviously cannot convey the spectacular of a complete eclipse, with it’s red moon during the eclipse refusing to be properly portrayed through my lens. The rocking boat didn’t help either with the long exposure times …. 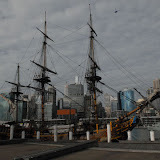 I met some very nice Sydney siders in the process, even though I was probably the only one over 30 on the boat … The title of this post is a quote of one of the more chemically altered passengers, who came crawling out of the captain’s cabin about halfway through the complete eclipse and realized that an essential part of the night sky had gone missing …. Not sure he remembered what the official excuse for this party was. So, all the more reasons to go out howling at the moon. 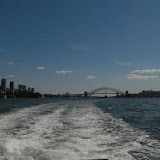 I went whale watching today on a trip outside of Sydney harbor. An incredible experience as the pictures below will show. These creatures came all the way next to the boat, apparently curious who was floating around there and attracted by noise we made, circling our boat for the better part of an hour, playing with each other, waving their tails and blowing air once we found them. They’re gracious in their movements despite their enormous size and weight. True kings and queens of the ocean and worthy of our care and preservation. After a lengthy transfer with Thai Airways from Tokyo to Sydney via Bankok, I’ve firmly landed in Down Under. This having been a lifelong goal of mine, I was looking forward in particular to my time in deamland. Sydney so far presents itself as very pleasant, albeit somewhat sleepy: Shops close at 6pm and unless you know where to go, there’s little night life in sight in the city center. However, look more closely, and you’ll find great things to do. 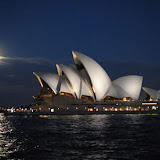 The Sydney Opera House is indeed impressive as the picture below will show. And even though it has a bum rap for its acoustics, they’re actually not so bad. Albeit, I wish their opera orchestra were a tad sharper, especially their horns. When I went to see a presentation of the highlights of opera (i.e. a best of collection of popular arias, the orchestra’s horn section put down a solid performance: from bum notes to late entrances and shredded intonations, they covered the entire repertoire of how not to play your instrument. The singing was lovely, though. So, unfortunately, in the case of the Sydney Opera, the content didn’t quite match the packaging. However, it must be said that Australia has developed a very systematic approach to developing young talents in classical music. And even though they still have ways to go in terms of their orchestra, such effort needs to be commended. The next day I undertook an excursion into the Blue Mountains, a mountain ridge right behind Sydney, cutting off the East coast from the remainder of the country. Apparently, the blue haze that gives the mountain range its name comes from the reflection of sunlight in the air that’s drenched in dropplets of eucalyptus oil from all the trees covering the mountains. The sights, amongst them a rock formation called the Three Sisters where absolutely astounding. On our way there we stopped by a wildlife park showcasing local fauna such as koalas and kangaroos. See for yourself, but I think they are wonderful creatures. But then, I could fall in love with a milliped …. As I move on with my journey, I’m inspired by the everyday and the world. Sorry, but I digress again: Alberto Gonzales – Attorney General of the US and chief enabler of everything that is constitutionally wrong with the presidency of George W. Bush has finally resigned. It seems, he has finally lied to the US congress just once too often. It is only befitting that this should happen the same week that the cradle of European civilization, Greece, is up in flames, battling to preserve its most ancient treasures, amongst them the site of Olympia, where the first Olympic games were held. As much as history is going up in flames in Southern Europe, so has Alberto Gonzales put a torch to everything that made the United States a great country, deserving of global respect. He led the way to torture in American prisons and the subterfuge of law and order and the constitution by the Bush administration. It is only time that his tenure at the “Justice” Department finally goes up in flames. Sorry, if I digress for a moment from the subject of my current travels. I’m in Sydney right now, and, as behoovs a proper member of the British Commonwealth, the story of the 10th anniversary of Princess Diana’s death is everywhere. I’ll never forget the day she died. It was the day I was emigrating from Switzerland, following my corporate job to a three year stint in Vienna, Austria. I sat in the business class lounge and everybody sat around the TV sets that showed nothing but footage of Diana. Many people cried, shaking their heads in disbelief. It was an ominous and strange beginning for my time as a member of the diaspora. BBC World this week is showing several reports on Tibet and the Chinese Government policies towards that region of their country. If you can view that channel you should try to catch these reports. Or go to their website: www.bbc.co.uk, or here. They are a very friendly, if formal people. The first Japanese I met was my taxi driver, who not only wore white gloves and a three-piece suit in 100 (35C) degree weather, but also, despite a language barrier was extremely concerned with providing the very best service to me. Not only did he absolutely refuse to get any help from me in handling my 33kg (70lbs – the bag was about the size and body weight of my driver) bag, but also upon arrival at the hotel, he didn’t let go of my trunk until he had dragged it all the way into the middle of the hotel lobby – and then refused to get a tip! On his way out, he kept bowing to me until he was out of sight…. Now imagine that in New York City …. Bowing is in general a vital part of formal interactions between Japanese. When someone purchases something in a store, it is not unusual for the sales person to follow the customer out into the street, handing the bag to the customer and then following-up with a series of 90 degree bows. The angle of the bow seems very important: The deeper the bow, the deeper the respect that’s being demonstrated. Also, technological gadget live squarely at the center of Japanese life. I wrote earlier about their high-tech toilets, and I haven’t even covered all the options. 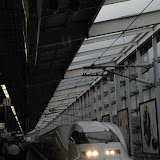 Also their trains are a technological work of art. Comfortable and smooth to ride in, complete with a friendly smiling conductor who bows in light of the privilege of looking at your ticket. Also, at every street corner they have these drink vending machines, where you can get anything from an iced caffe latte to iced green tea or soda. So, you’re never than a few steps away from rehydrating … not a bad move in their hot and humid summer weather. In general, Japanese seemed very reserved to me, but upon my rather miserable attempts of speaking to them in Japanese, they usually thawed, probably moved by my ineptitude, and proved quite friendly and talkative and more than willing to help with any question I might have. So, I spent a few subway rides in very interesting conversation. I’d love to come back and spend more time and get to know this people more closely. Hopefully then with a better result in my attempts at speaking Japanese …. Kyoto is a strange mix of old and new. Most people live in modern housing similar to western style buildings. But every now and then there’s an old building squeezed in somewhere or an old temple around a corner where you didn’t expect to find one. I never saw a Geisha (only two old ladies in a kimono) but otherwise I found the place very fascinating. Also, the hotel I stayed in has my nominee of most comfortable hotel bed in the world … or then maybe I was just exhausted after running around the city all day and then getting rained at, … and I mean absolutely, positively drenched. It’s been an oppressive heat all day, hot and extremely humid to the point that the heat burned on your skin, so I wasn’t surprised to see a thunderstorm draw in. But I was walking down the street one minute and found myself literally diving for cover the next as the deluge came on without any warning. I jumped into a city bus that had just happened to stop right next to me. The bus could have been the one to hades for all I cared, but I decided now was as good a time for a bus ride as any. A local business man I met later on in the subway told me that these deluges are very common this time of year. I’ve paid a visit to the Kyoto Imperial garden, which is stunningly beautiful. 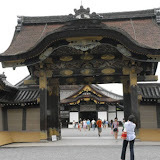 I couldn’t get into the palace, since you need a formal permission to enter the palace. 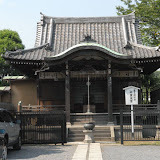 But I managed to get one for the following day for the so-called Sento Palace, where retired emperors lived and today’s imperial family still stays occasionally. Here are some of these pictures. We weren’t allowed to enter the main building, but the garden was more than worth coming for. During the tour, we had a guide who spoke into this weird machine, probably to be heard louder. He kept talking a long time, but I couldn’t understand a word he said. He only spoke Japanese. 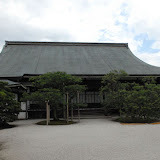 Also, I found another palace nearby, called Nijo Palace. I think I now understand where Frank Lloyd Wright found the inspiration for the design of a house that was the model for the home of my grandparents … A highly fascinating place, built during the shogun period, where most of the outside and inside walls are sliding doors. I wasn’t allowed to take pictures outside but here are some pictures from another spectacular garden. Not much time to talk, but here are some photos from my trip to Tokyo. 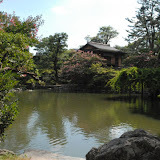 I went to Ueno Park in the north of Tokyo, to check out some of the city’s museums. On the map, they showed a lake so I went looking for it, hoping for a little cooling off in the steamy 32 degrees celsius (ca. 95F) heat. Ran back & forth and couldn’t see no lake until I realized, I stood right next to it…. It was hidden underneath a carpet of what are either huge water lilies or lotus flowers. Found a zoo nearby and wandered in when I got nearly eaten by an alligator, if it hadn’t been for that big thick glass pane between us. I was taking a picture, when he jumped. Unfortunately the photo didn’t come out. Now that would have been an ending … The panda bear obviously wasn’t in the mood to be gawked at, so I never got to see his face … but his backside is lovely. Speaking of backsides: In my hotel room they had one of these Toto contraptions, the Japanese high tech toilets that come with seat heaters and a whole lot else. Some of them apparently caught fire earlier this year. Call it a porcelaine inferno, if you like. Nobody seems to have gotten hurt, though.